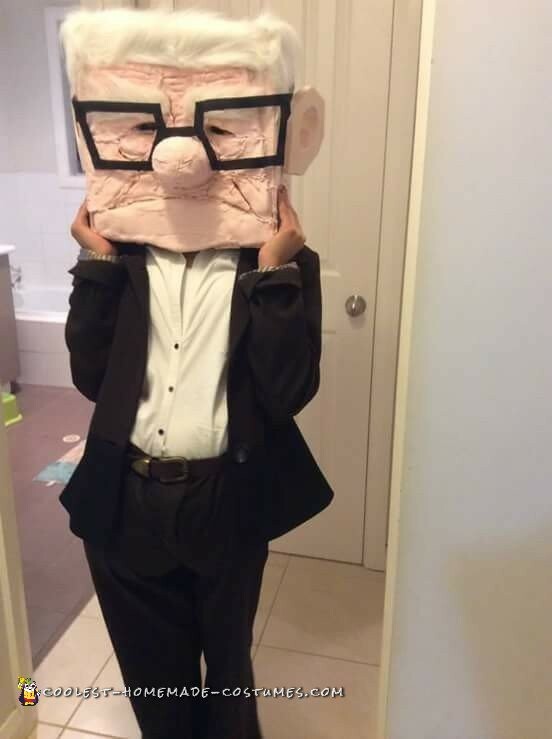 I made this Carf Fredricksen costume from a few boxes. 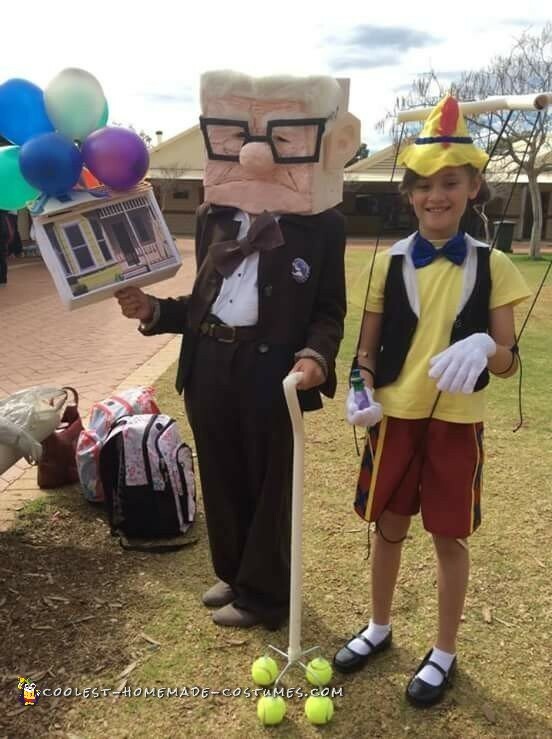 Carl was a family affair for bookweek. A clay molded face was created on top of a box to make the head and lots of hot glue. Carl’s face slowly came together. The box was heavy but it sat nicely on my daughters shoulders and she didn’t have to wear it for too long. The eyebrows and hair were made from some dress up beards from the $2 shop and cut to fit and glued on. A bit of flesh coloured paint with more glue mixed in ensured the heavy clay did not fall off the box. The clothes were borrowed and a few more accessories needed to be made to finish off Carl properly. A picture of Carl’s house was enlarged and printed then glued to a small box. A couple of holes were made in the bottom and top of the box so a pipe could be inserted through in order for my daughter to hold it and have something for the balloons to be tied to. The roof of the house was thatched with ice cream sticks. The last item made was the walking stick made with another pipe and tennis balls and some metal clips bent by dad in order to go through the tennis ball and glue to the pipe. The bottle top badge and safety pin were just printed and cut out. 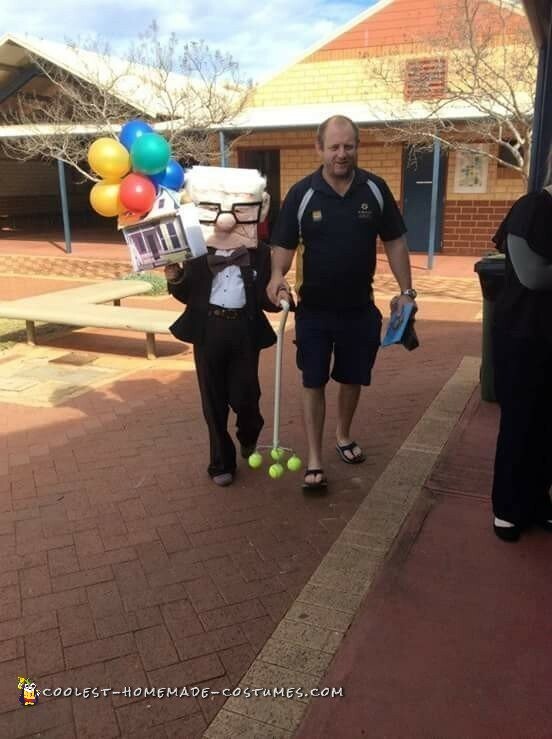 Carl was such a great costume to make for all of us as there were so many handmade elements that could be made. I think if the head hadn’t looked so good it would not have been such a big hit. It was clearly handmade which made it such a great proud moment for all of us to be involved in its making. Carl was so good when we moved to NZ we had to pack him up carefully to travel with us. Such a great character! 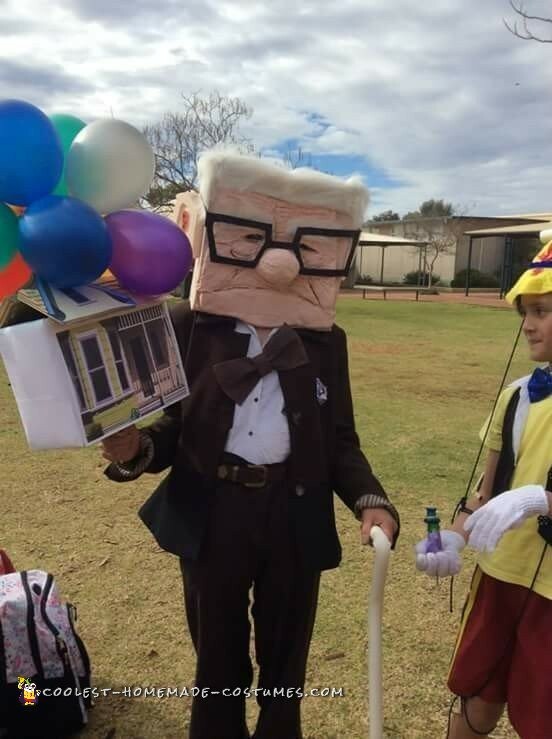 Homemade costume idea posted by Lynnette H.